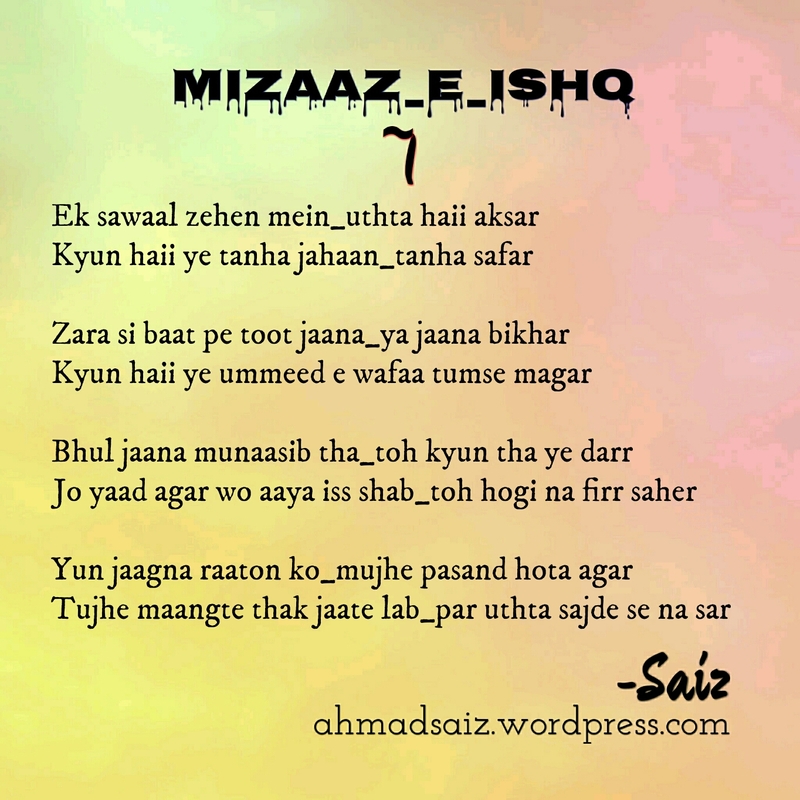 Mizaaj e Ishq: #7. Ek sawaal zehen mein – I'm Here; Right Here. Ten seems to be a good number. That’s my enrollment no. even. Well. Nothing’s ever going to stop me from doing non senses at ease. I penned this one down some time ago. I was checking my drafts today and thought this deserves a better place. Anyways. I’ll leave it by you to decide if I’m not wrong. Secrets of My Diary: #3. Satisfaction is bliss! Story of a Poet: #35. I am sorry I had no other way; but, die. Per uthta sajday se na sir…..oh wow. That was so beautiful. Never knew we had such a great urdu poet between us. Simply love your poem. Pain makes us poet, right? Hahha….thank you so much Ma’am. Its an honour to receive appraisal from such a talented writer herself. No, nooooo…. I’m not great. I stand no where into Urdu Poetry genre. But, I can expect an addition of a reader to my fairy list from now. Right? Pain does makes us poet. i’m a sucker for Urdu poetry. i can barely understand Urdu and yet, i think it’s the most poetic language. I just loved the last lines…uthta na sajde se sar…yaar ab to tarrif k liye shabd kam pad jate hain. apki shayari to har din kuch naya andaz le kar ati hai. Its called ‘tafreeh’ Saiz, as you know very well. That really was a good ‘tafreeh’. But you wrote firr. :3 But you meant phir? Anyway,I like it that is simple yet so beautiful! Oopsie yeah I saw now.Sorry for disturbing. Writing styles differ. I double the letters at the end to give it a more of an Urdu pronunciation. Thanks again. I loved it too. That is ins’t disturbing btw. It’s okay. Just curious about one point, this being an Urdu poem, is the ‘firr’ in “to hogi na firr saher” the Urdu word ‘phir’ or is it the Hindi version of it (firr/fir)? Or, is it just some other word? And yeah, this ‘phir’ is the same as ‘firr’. The writing styles differ sometimes.